Once again I'll be getting us a club stand at the Scottish car show. The event is back to normal and is again just on the Sunday and in my opinion the one day event works much better. This is the biggest car show in Scotland and is a great event. I'll have all the usual stuff for our stand (banners, flags and a nice new gazebo). Remember this is a family event so bring yours along! Under 16 - Free but I must know when you pay for a ticket for a show car. Otherwise £10 on the day. I'll be booking and paying for this on 26th May as it's pretty much as late as I'm allowed I would advise you all to pay ASAP as every year I have people trying to book after the closing date as it's soon here. Ideally you can PayPal me at bensoldflameredmini2008@hotmail.co.uk Please send as money to a friend otherwise I don't receive the full amount (as always no money is made from our members at anything I organise) Please also add a comment to your payment with 1.Your name 2.Club user name if you have one 3.What you're paying for. You can also pay cash if you see me at an event or if I'm working on your car in this time. Firstly our stand is very relaxed but there's a couple of things we do. 1. No drink or drugs on our stand. This isn't allowed anywhere on the event but is something I won't tolerate on our stand as I've said we're a family friendly club. 2. Although outside I ask that people don't smoke on our stand as it's unfair to expose other members to this, Decat fumes are fine though as we are a rotary engine club. 4. Once we're in you can't leave until the public have gone, If you have an emergency and have to leave you'll have to make arrangements to collect the car once the event is finished. 5. No car movements while show is in progress, We're asked not to even have the engine running. We have received a warning from the event before as we had 1 member who decided to ignore me on this, The club gets a bad name for this not the individual. We will be leaving here at 0715 it's your responsibility to make sure you arrive here on time, If you're not there on time you'll simply loose your ticket. In the past we have waited for people who don't bother showing up and it's not fair on members who turn up. As always any questions please just ask! Lins is that side I'm sure she said she would put you up. Like to put my name forward for Scottish car Show please. Ben, sign me up! Car & driver. 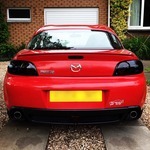 Velocity Red 231; Apex Rotary engine rebuild; Toyosport decat exhaust, FK Automotive coilovers, OEM sat nav. Looking for spacers. Next project; sat nav conversion to tablet. List updated with who's coming and who's paid. Closing date for stand tickets is fast approaching! Hannah Crawford added to the list and paid. The stand is now booked, 12 cars is going to make a good stand thank you to everyone who has committed to coming to this event.